It is safe to assume that the 90’s brought the first ground breaking record for the color category with the Graff Pink Supreme diamond. This 10.83 carat, pear cut, Internally Flawless, Fancy Vivid Purplish-Pink stone was sold in Christie's 1993 Geneva auction for more than $6.4 million. This translates to approximately $591,000 per carat; a remarkable price for a colored diamond in the early 90’s. As the initial record holder, this stone could go on to serve as a basis of comparison for the remainder of the pink diamonds that have been auctioned in the more recent past. So how did the new millennium affect pink diamond cost? Three of the most coveted pink diamonds to ever be sold came to auction within just one year of each other, garnering huge attention and even bigger sales prices. The first was the Vivid Pink diamond. This 5 carat, cushion cut, VS1, Fancy Vivid Pink stone made a staggering appearance in Christie's 2009 Honk Kong auction where it sold for $10.78 million (yielding slightly more than $2 million per carat). The clarity and color classification of this diamond makes it one of the most expensive pink gems per carat to have ever sold at auction until that time. It goes without saying that the Graff Pink amazed the world when it was able to surpass the previous price record only a year later. This 24.78 carat, emerald cut, lla, Fancy Intense Pink managed to fetch $46 million (approximately $1.86 million per carat) at Sotheby’s 2010 Geneva auction. This did not only make it the most expensive pink gem up to date, but also the most expensive diamond ever purchased at a public auction. Since then, the gem has gone under ever more processing and currently weighs 23.88 carats and has been upgraded to an Internally Flawless Fancy Vivid Pink stone, further increasing its overall value. 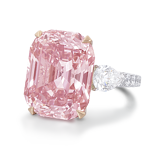 The Perfect Pink was another stone that manage to fetch an astounding price of $23.3 million (or approximately $1.64 per carat) at Christie's 2010 Hong Kong auction. While the 14.23 carat, rectangular cut, lla, Fancy Intense Pink was not able to break any records for its category, it was the most expensive pink diamond sold by Christie's to that date. What’s more remarkable is that all three of these diamonds were sold for these astronomical price tags during the height of the financial crisis. The last five years continued to feature diamonds fetching jaw dropping prices, constantly setting new records for the category. The Sweet Josephine is a remarkable stone purchased by billionaire businessman Joseph Lau during Sotheby’s 2015 Hong Kong auction. The 16.08 carat, cushion cut, Fancy Vivid Pink sold for $28.7 million (approximately $1.78 million per carat). Despite not breaking a price/carat ratio record, the Sweet Josephine’s price is still remarkable and the stone itself is worth mentioning on the list for its beauty. Last year, the Unique Pink came close to setting a new price per carat record; however it fell short of the record set by the Vivid Pink back in 2009. 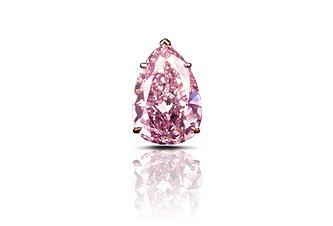 The 15.38 carat, pear cut, Fancy Vivid Pink gem ultimately sold for $31.6 million at Sotheby's Geneva auction. Despite not setting any new price records, the Unique Pink holds the record for the largest diamond of such caliber in its category. 2017 was one of the most robust years in terms of record breaking pink diamonds. The Pink Star made a return and this time officially shattered the record for most expensive pink stone (and most expensive colored diamond) to ever be sold at a public auction. This truly magnificent gem managed to fetch $71.2 million on April 4 at Sotheby’s Hong Kong auction last year, and was bought by renowned jeweler Chow Tai Fook. 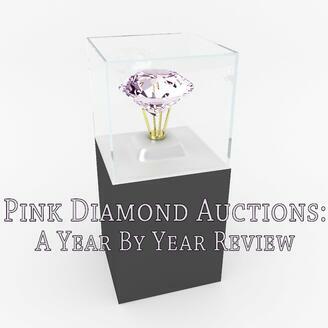 Pink diamonds have shown a continual growth in value year over year. At the upper echelon, these pink diamonds see an average price per carat of $1.5 to $3 million per carat. 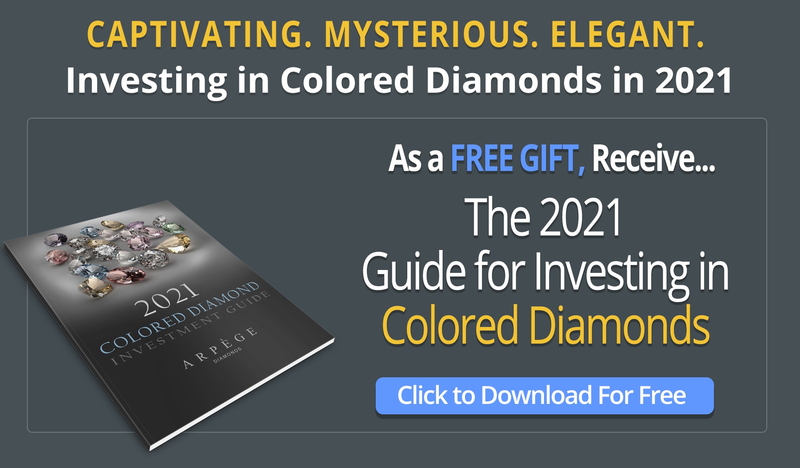 Investors and collectors are taking notice of these increasing values, and as supply decreases with the upcoming closure of the Argyle Diamond Mine, the demand is sure to continue to drive up this price. If you enjoyed this article check out some other great reads from the list below. And as always feel free to follow us on Twitter and LinkedIn.